Meyerco’s Lightfoot & Lambert knives are perfectly comfortable at home, in the woods, or on the battlefield! Over the years, I’ve developed a justifiable faith in the abilities of the liner-lock system. The test folders had full engagement providing a secure feeling during use. We are never too old to learn, and just recently I was taught a lesson that directly impacts this knife review. While talking to a friend I had not seen since high school, I was trying to explain my occupation of photographing and writing about knives. During the conversation, we were discussing the different styles of knives, and I was using four Meyerco knives that were sitting on my desk as visual aids. While using all of the proper catchphrases and modern descriptions, I might as well have been speaking Latin. Have you ever seen a deer caught in the headlights? There were two problems with my efforts. First, some people have not been exposed to the world of cutlery past the level of kitchenware. Secondly, the knives defied my efforts to categorize them. After explaining the attributes of a good outdoor knife, I switched over to talking about tactical knives before chatting about the perfect every-day-carry (EDC) knife. At that point I decided there was only one thing I could do—I’ll describe them, show how they perform on various tasks, and then let the reader decide how to categorize them. The four Meyerco knives were actually only two different models. However, each model had a serrated and non-serrated version. Two were the Catch Dog, designed by Greg Lightfoot, and two were the Shock Wave, designed by Kirby Lambert. 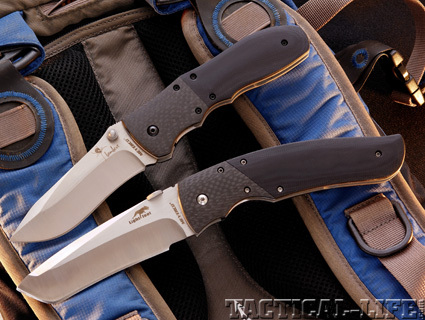 Greg and Kirby are both well-known custom knifemakers in their own right, but are also part of the Meyerco design team. Long ago, Meyerco learned the benefits of collaborating with custom knifemakers in developing new models. The first thing to point out about these knives is that they are the result of a true international effort. Both designers are from Canada, the knives are marketed by Meyerco of Dallas, Texas, yet they are manufactured in China. The pocket clips did their job without a hitch, but it would be nice to switch them to the other side at times. On a defensive knife, I might consider removing them completely. While the blade and handle patterns differ between the two, the materials are the same. 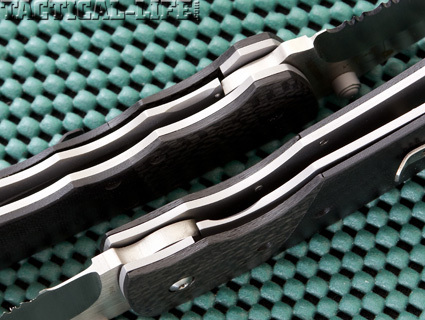 The handle scales are fabricated from G10, while the blades are 8CR13 stainless steel with a slight hollow-grind. The bolsters are carbon fiber and both models have stainless liner locks. Meyerco is noted for their “spring-assisted” folders and these incorporate that technology. In an effort to accommodate use with either hand, the Shock Wave has dual thumb studs, while the Catch Dog has a disk mounted on the spine of the blade that is accessible from either side. However, both use right-handed liner locks. The Catch Dog is the larger of the two models with a 4.25-inch blade, and when opened, an overall length of 9.63 inches. The blade is 3/16 inches at its thickest point and the pattern is similar to a tanto style. The 5/32-inch thick blade of the Shock Wave is 3.75 inches long, and when opened, the knife is 8.44 inches. As mentioned before, each model comes with either a straight edge or one with a 1.25-inch section of serrations. The slight re-curve on the Shock Wave increases the cutting efficiency during use, allowing it to easily bite into this tough hardwood stick. While testing these knives, it is not my intent to pit them against each other, but to discover the usefulness of each model. My first endeavor was to use each in an EDC mode. Neither could be considered a small knife, but they did ride well in the front pocket of jeans. Whenever I wore lighter clothing, I found the larger Catch Dog to be a bit heavy in a front pocket. 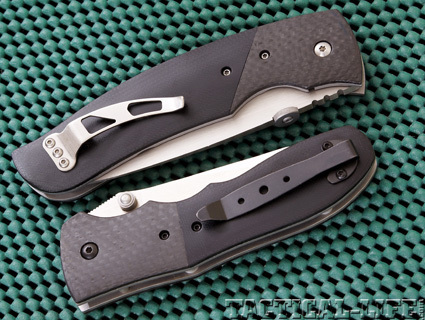 Both pocket clips had the proper tension and held the knives securely, but it would be nice if Meyerco would make these capable of being switched to the opposite side. The spring-assist function operated well, with the lighter blade of the Shock Wave being the fastest. As with any spring-assisted knife, you have to manually start the blade in motion, and the Meyerco knives were easy and smooth during this process. EDC knives need to be utility blades above all else, and the knives performed every chore over a two-week period without a hitch. The only problem was deciding which one to pull out. My work around the house ran the gamut of mundane chores, such as opening seed and fertilizer bags, to cutting garden hose. The knives came sharp from the factory and stayed that way over the period of use. That is saying something when you realize that activities such as cutting rubber hose and cardboard can be hard on an edge. The serrated section on two of the knives may be better at cutting some materials, but I found myself preferring the knives without the serrations. At no time did I notice any rough or “hot” spots on the handles to wear against my hands. The mating of the scales to the liners, and the scales to the bolters was well executed for knives in this price range. 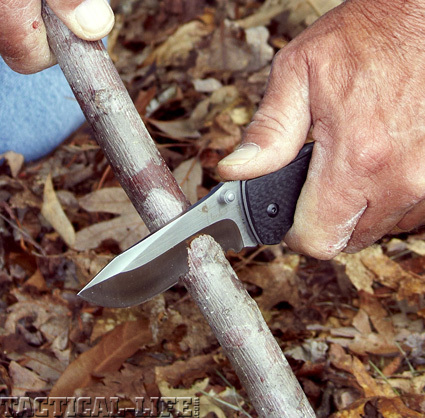 During my test period I had the perfect setup for using these knives as outdoor tools. Each year I hold my annual camping trip, PWYP (Practice What You Preach), at the Chestnut Mountain Proving Grounds and the time for the event was rapidly approaching. Being the host, part of my duties is to at least look like I know what I am doing. Not wanting to wait until I was in front of the crowd to try out a few new pieces of gear, I went out and set up a mock campsite this past weekend. The performance of an old Vietnam-era hammock was improved once I added a framework fashioned from saplings to support the mosquito netting. Cutting 1-inch poplar saplings was a breeze. The slight re-curve to the blade of the Shock Wave assisted in having the blade dig into the material rather than trying to slide off of it. It was only after the first wind came by that I found out how futile it is to rely on thin wire tent stakes to hold my tarp in place. A couple of moments with a machete left me with six new wooded stakes that could be sharpened with the Catch Dog. I found the Meyerco knives ideal for cutting everything else from ropes to the steak as it came off the campfire. I wanted to fashion several examples of improvised traps to display during the outing and the two knives handled well for the close work on the trigger mechanisms. Given any of the Meyerco knives and either a machete or hatchet, I would feel well equipped in the outdoors. Cutting cardboard is hard on a blade’s edge. 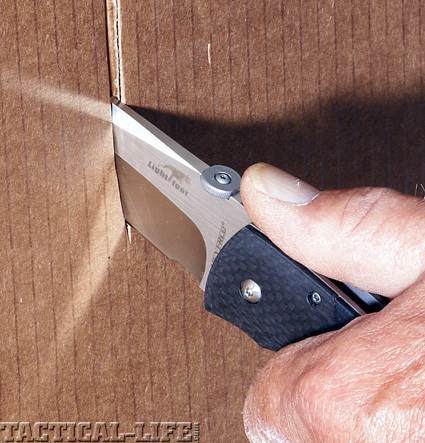 If you want to test your knife, just see if it drags during the cut. The final consideration for these knives would be how well they could perform a defensive role. It is only fitting that this style of use be considered last. Even the most ardent “tactical” design will be used as a utility blade first and a weapon second. Although the handle patterns are quite different, both provided a secure hold no matter what grip form was used. It is worthy to note that this is the one time when I found the pocket clips to be a hindrance. You can remove these clips and it is up to the user to decide their value versus the comfort while gripping the handle. Either blade was large enough to be considered a formidable weapon. Slicing cuts on carpet rolls proved the knives capable of producing deep wounds. The handles were long enough to provide a protrusion useful as an impact weapon. Since my efforts to explain the uses of these knives to my friend, I am no closer to being able to fit the Meyerco knives into a set niche. I found them to be well made and more than worthy of any label you would want to tack onto them. Only you can decide which blade or handle pattern is best suited for your needs. However, if you’re at home, in the woods, or saving your hide, one of the Meyerco knives should work well for you.